long term problems of anxiety, depression, anger and stress! Hello, I'm Dr.Norm Ephraim, a licensed psychologist in Boston, Massachusetts. With over 35 years experience helping people improve their lives, I have some important questions to ask you. Paralyzed with anxiety, panic, or daily stress? Coping with depression or just plain unhappy? Overwhelmed by anger and self criticism? Struggling with unhealthy eating, smoking, or high blood pressure? Feel relaxed, confident, and achieve your goals? Find more pleasure in life? Discover greater tranquility and self esteem? Develop greater self control, pride, and a healthier lifestyle? Build greater trust and intimacy? Learn Mood Shifting for a change! 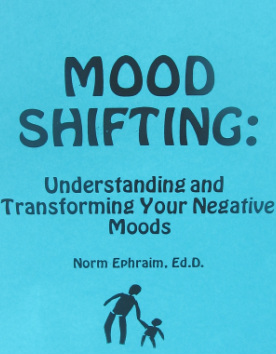 To learn more about Mood Shifting, click the book below.